My American Photo Stories :: Places I've been in the United States of America, People I've seen, Roads I've driven on, Nature, Love, Life, the photos and the stories behind each one! 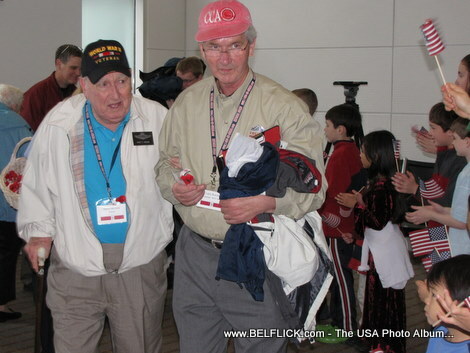 Here are some photo of World War II veterans as they arrive at Washington Dulles International Airport in a US Airways honor flight to visit their memorial on April 15, 2009. 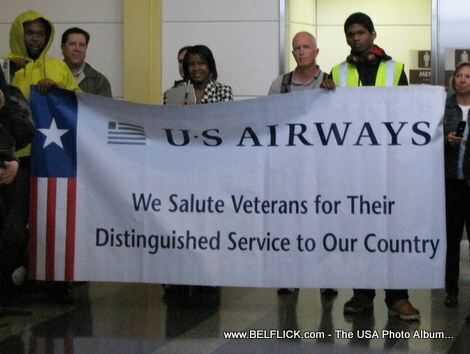 Take a look at this photo... A group of US Airways employees hold a banner with the American flag on the side and a message that reads: US Airways with salute Veterans for the distinguished service to our country. This was the airline company's way of honoring a group of World War II veterans who had just arrived at Washington Dulles Airport on a visit to Washington DC memorials. The old man on the wheelchair is a World War II veteran. He is on the trip to Washington DC to visit memorials dedicated to honor the service and sacrifices he made for his country. The people cheering actually passenger at the airport who are forever grateful for the sacrifice he has made. A bunch of US Airways airline passengers lined up in front of the gate waiting for the arrival of an honor flight of World War II veterans who are on a visit to Washington DC to visit memorials dedicated to honor the service and sacrifices that made for their country. The passengers received the announcement from airport personnel and they're lined up and ready to clap and cheer for this old veterans. 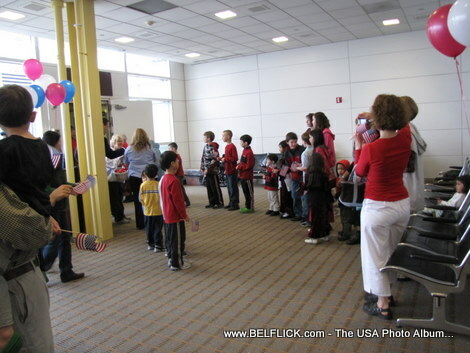 Here is a photo of a US Airways honor flight arrival of World War II veterans at Washington Dulles International Airport. Yep... That was a bad shot... LOL... But hell, I hate deleting my pictures. There's always a story to tell right? This is definitely someone's grand father, and a war hero too. It's not like I asked them to stop and strike a pose. But you can still make out the face thought, can't you? How often do you see Airline passengers waiting patiently in line BUT NOT to actually get on the plane? 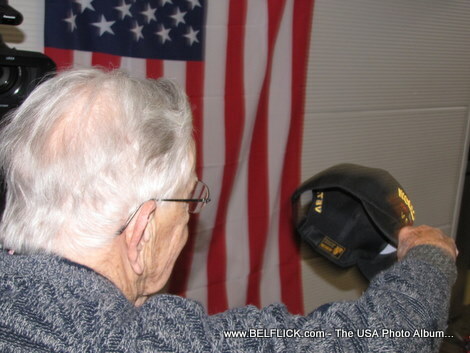 I am not sure if this World War II veteran took off his hat to salute the American flag but it sure as hell looks like it doesn't it? 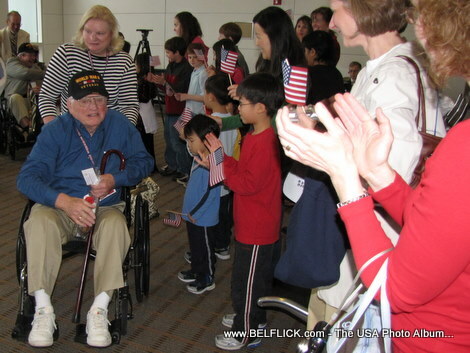 This happened at Washington Dulles International Airport in Virginia As World War II veterans got off an honor flight ans were greeted by a whole bunch of passengers clapping and cheering for them. That's why it's always good to have your camera ready and, like my old photography teacher said, always keep shooting when people are moving around. You never know what great shot you are going to get next and some of them will be pure accidents. I'll tell you, I did not intend to take this picture but for some reason I like it. Think about it for a minute. 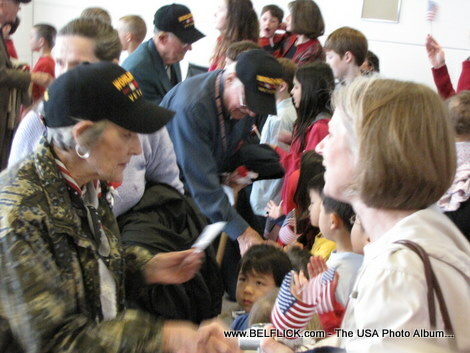 How often do you meet or hear people talking about the women in World War II or a woman World War II veteran? It is as though we forget that they were actually American women in World War II. The picture you're looking at shows you one of these Great American women being greeted bye her fellow American woman at Washington Dulles International Airport. Talk about being grateful... A picture is worth a thousand words isn't it? A little history lesson: During World War II, approximately 400,000 U.S. women served with the armed forces and more than 460 lost their lives as a result of the war, including 16 from enemy fire. 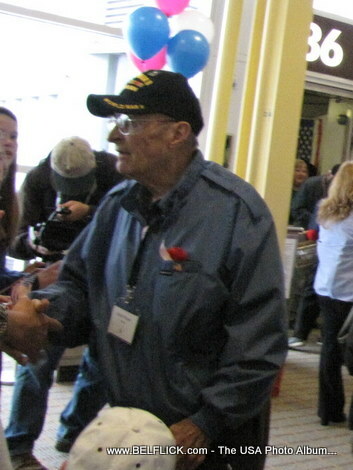 These World War II veterans deserve all the honor they are receiving. Soon after the Honor Flight transporting America's veterans to Washington DC to visit the memorials dedicated to their honor, airport staff asked passengers to line up and salute these veterans. It was a really moving moment that I got a chance to witness once in my life. 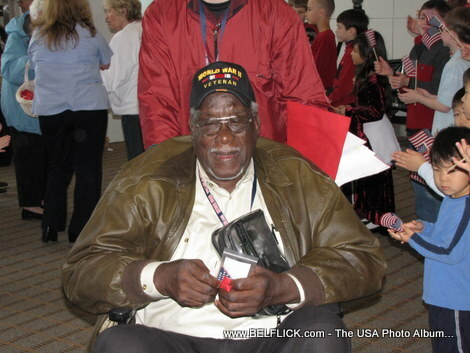 An African-American World War II Veteran In Washington DC to visit the Memorial. 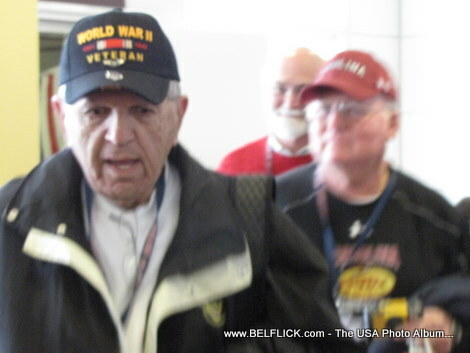 Here is a photo of African-American World War II Veteran from an honor flight to Washington DC to visit the Memorials. How lucky can you be to fly on the honor plane that just carried a whole bunch of World War II veterans to Washington DC? Yes I do feel lucky actually These men for hard for what America is today kudos to all the World War II veterans out there.